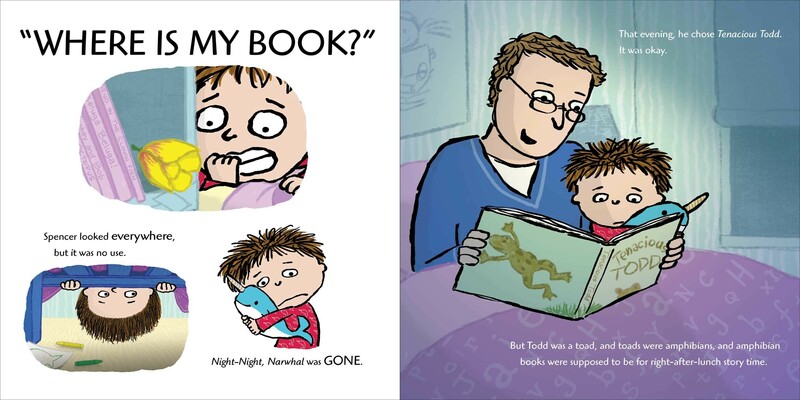 By Sue Morris @ KidLitReviews September 9, 2015 books Debbie Ridpath Ohi library Michael Ian Black Narwhal Night-Night Narwhal Reading siblings Simon & Schuster Books for Young Readers Spencer Tenacious Todd Where Are My Books? But who could it be? Spencer loves no, he adores his books. Each night, Mom or Dad read him one of his favorites, usually Night-Night Narwhal. Spencer loves narwhal whales. One night Mom reads this to Spencer, kisses him goodnight, and soon Spencer his dreaming. But in the morning, there is a problem. A BIG problem—Night-Night Narwhal is GONE! Where could it have gone? And why is there a yellow flower were the book should be? Spencer meticulously organizes his picture books and this book should have been farthest to the right. But it’s gone. He looks everywhere, but sadly no book. That night, Dad reads Spencer Tenacious Todd. Uh, oh. Mom makes Spencer join a picnic with his sister and her stuffed friends. Spencer is miserable. But if his sister did not take his books, and mom and dad don’t know where the books are, who keeps taking his books? How does this person get to his books before he wakes up? Well, Spencer has a plan. Will it work? I adore Where Are My Books? 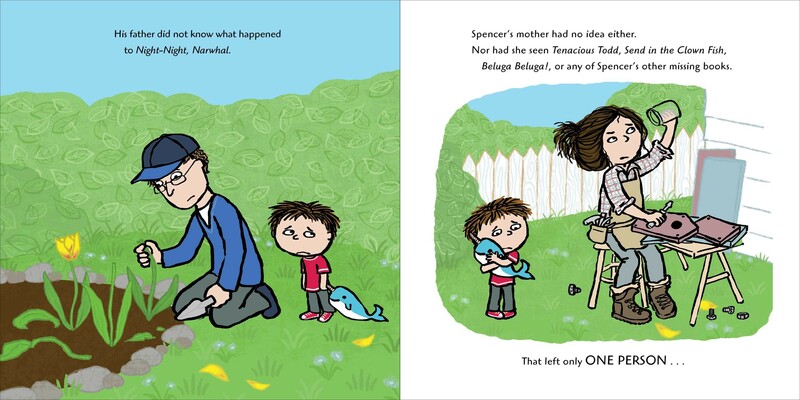 The story of Spencer and his missing books is full of heart and humor. Spencer accuses the most likely suspect earning him a picnic tea party with his little sister. Fed up, he devises a plan that almost costs him his stuffed Narwhal. Spencer’s devotion to his books and his love of reading—and being read to—should inspire young children to enjoy reading and to organize their own bookshelves, guarding them from an unusual book thief. The digitally rendered illustrations are most definitely kid-friendly. There are small details, like the screws and tulips, which will catch the observant reader’s eye. (There is a wonderful poster in Spencer’s room.) Spencer is a cute young boy who loves his red narwhal pajamas. The culprit is just as cute and wears small spectacles while reading. The ending is not what you would expect, nor will kids figure it out early, but it does explain the small screws, nuts, and flowers left in place of each book. And Spencer makes a terrific deal that is satisfying for everyone, including the reader. 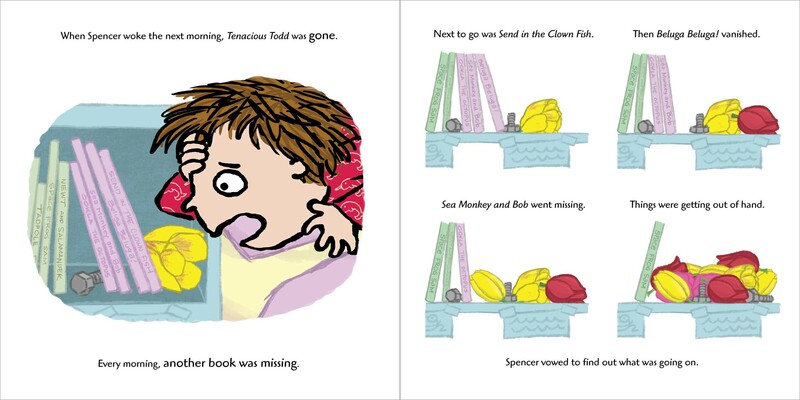 Kids will also learn a little about library rules when Spencer solves his missing books problem. Parents will enjoy reading Where Are My Books? multiple times, as will surely be requested of them. Parents will also appreciate Spencer and his sister’s blossoming relationship. Where Are My Books? is one of those picture books your child will love for a long time. Those who love picture books, of any age, will adore Where Are My Books? 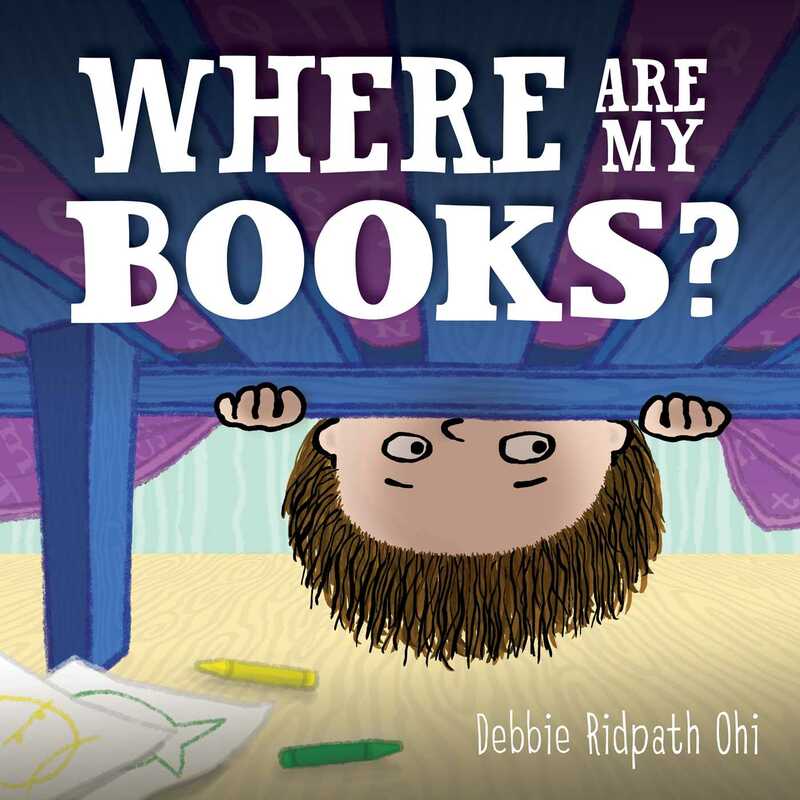 Debbie Ridpath Ohi’s first solo picture book is a resounding hit. Do not miss Where Are My Books?—or let little book nuts take it away without permission or without leaving a tulip in its place. WHERE ARE MY BOOKS? Text and illustrations copyright © 2015 by Debbie Ridpath Ohi. Reproduced by permission of the publisher, Simon & Schuster Books for Young Readers, New York, NY. Purchase Where Are My Books? at Amazon —Book Depository—IndieBound Books—iTunes Books—Simon & Schuster. Read an Interview with young Spencer HERE. Learn more about Where Are My Books? HERE and HERE. How Where Are My Books? was Created is HERE. Spencer’s Animal Facts are found HERE. “I Love My Library” Posters are HERE. Activity Sheets—Bookmarks—Bookplates—Coloring Pages—Masks—Puppets are HERE. ” For The Love Of Reading” Activities are HERE.
. .Where Are My Books? Facebook Page is HERE. I’ve got nothing to add to brilliant, except, “Yes, she is brilliant.” Including her art work. Yes, you do. You will learn how important keeping a neat organized bookshelf can be and you might learn to be nice to Josie and be a good big brother. 😦 Nah, I know you are a great big brother! 🙂 You’ll appreciate this picture book. It is awesome! 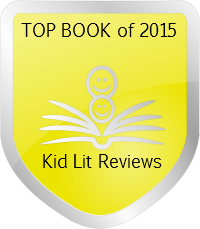 Yay, Debbie for being awarded a Top Book of 2015! We love her style and look forward to reading this one. It sounds delightful! Super duper review, Sue! I agree. “YEAH! Who-hoo! Mwa-hahahaha!” (oops, wrong shout out.) Don’t forget to vote for Where Are My Books? in November! I’ve read and written a review (in draft file). Fun to see what someone else thought! Always enjoy how you incorporate illustrations with your reviews. Very cute book with a great ending! Thank you. I like reading other’s reviews—after I have written mine. Sometimes it makes me think I missed something important, but usually they are just fun to read. I’m interested in what you think. When will you post? Not sure, I have read and reviewed a lot of books over the summer that are in my draft box as I have something coming up and my blog will be on hiatus for 18 days. If someone reviews a book ahead of me, I usually wait a bit, anyway. I understand that. Erik and I often get the same books and if he posts first, I try to wait unless I have promised a set date. We’ve made a game out of it razzing each other and claiming “points” when first to post, but no one is keeping score. I’ll keep an eye on your blog for the review. Sorry, no missing toys. Did you know squirrels can read? I thought they just taunted dogs. That’s what they do in my backyard.